Fenugreek is an herb with fascinating medicinal properties, ancient origins, and an enticing taste. Learn the best ways to use this beneficial plant. The fenugreek plant, which researchers believe to have originated in the Middle East, has been cultivated for centuries to be used as both a spice and a medicinal herb. It remains popular today throughout the world, but many people are unaware of the nutritional and medicinal advantages it can have. Enhancing endocrine function. Fenugreek has been shown to restore hormonal balance in both women and men. It is particularly helpful for relieving the premenstrual syndrome (PMS) and menopause symptoms, as well as for regulating testosterone production in men. Increasing breast milk production. 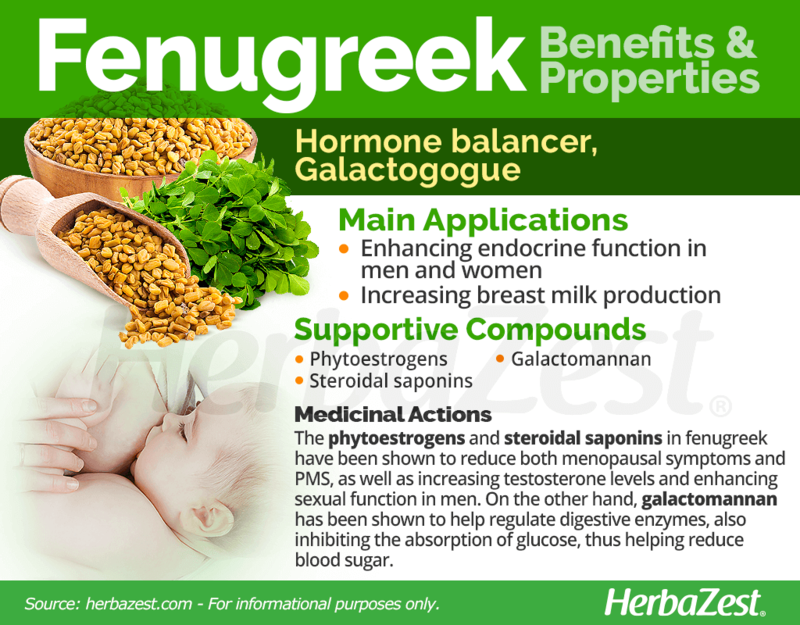 Due to its galactagogue properties, fenugreek has been traditionally consumed to induce milk secretion in nursing women. Lowering blood sugar. Fenugreek properties notably include lowering blood sugar and helping improve insulin production in people with diabetes. Relieving heartburn. The mucilage content in fenugreek prevents the irritation and discomfort caused by stomach acids and gastric ulcers. Reducing the risk of heart disease. Preliminary studies show that fenugreek may be able to reduce fat accumulation, thus being a useful therapeutic agent for fighting metabolic disease. Fenugreek seeds contain no essential oil and their characteristic scent and flavor are due to the presence of fenugreek lactone, an extremely powerful odorant agent. 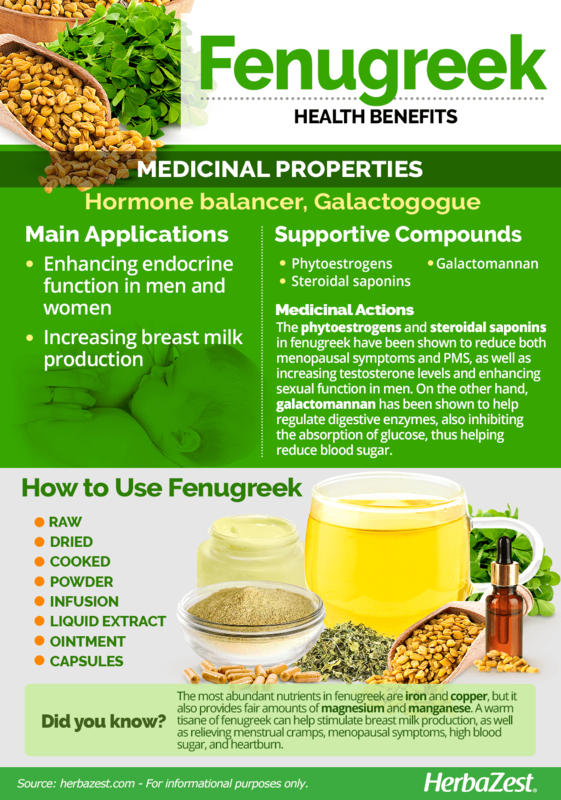 Fenugreek has been associated with increased testosterone levels and enhanced sexual function in middle age men with androgen deficiency symptoms, as well as with a reduced severity of both menopausal symptoms and dysmenorrhea, including menstrual pain, fatigue, headache, nausea, and lack of energy. These hormone-regulating actions, equally beneficial for both men and women, are attributed to a high content of phytoestrogens (stearic acid, palmitic acid, and beta-sitosterol) and steroidal saponins (diosgenin, tigogenin, neotigogenin, and yamogenin). The presence of phytomenadione (a vitamin K derivative that aids coagulation), as well as alkaloids, aminoacids (such as lysine), also contributes to the galactagogue, hypoglycemic, and hormone balancing properties of fenugreek. Additionally, fenugreek's omega-3 fatty acids and dietary fiber, as well as a water-soluble polysaccharide called galactomannan, are thought to contribute with the beneficial effects of fenugreek on metabolic functions. Galactomannan has been shown to help regulate digestive enzymes, also inhibiting the absorption of glucose in the gastrointestinal tract. The compound diosgenin is used to synthesize hormone-balancing medicines, which are prescribed for treating PMS and menopause symptoms, as well as sexual dysfunction in men. Herbs like dong quai, fennel, and saw palmetto also have hormone balancing properties, whereas cinnamon, figs, and yacon can be used as alternative sources for hypoglycemic benefits as well. While fenugreek is generally a mild herb, it can produce gastrointestinal side effects, such as bloating and diarrhea. Those with sensitive skin may experience irritation from topical applications of fenugreek. 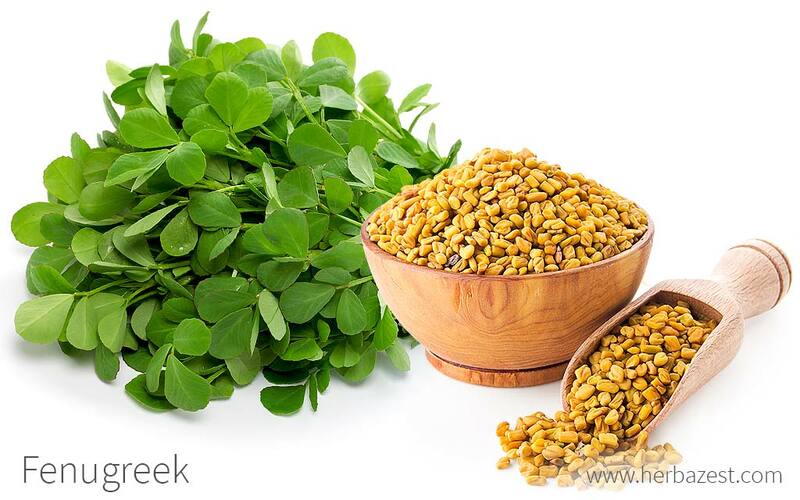 Fenugreek can worsen asthma symptoms and further lower glucose levels in diabetics. The herb also can cause uterine contractions and should not be consumed by pregnant women. Fenugreek health benefits, both medicinal an nutritional, are usually obtained from small, culinary amounts. The fenugreek spice has a low caloric value and contains very little fat and carbohydrates; however, it provides fair quantities of protein. This aromatic herb is an unexpected, good source of iron and copper, both of which are crucial for blood cells production and bone formation. Fenugreek also contains adequate amounts of magnesium, essential for hormonal balance, coagulation, calcium absorption and blood sugar regulation, among other important body functions. 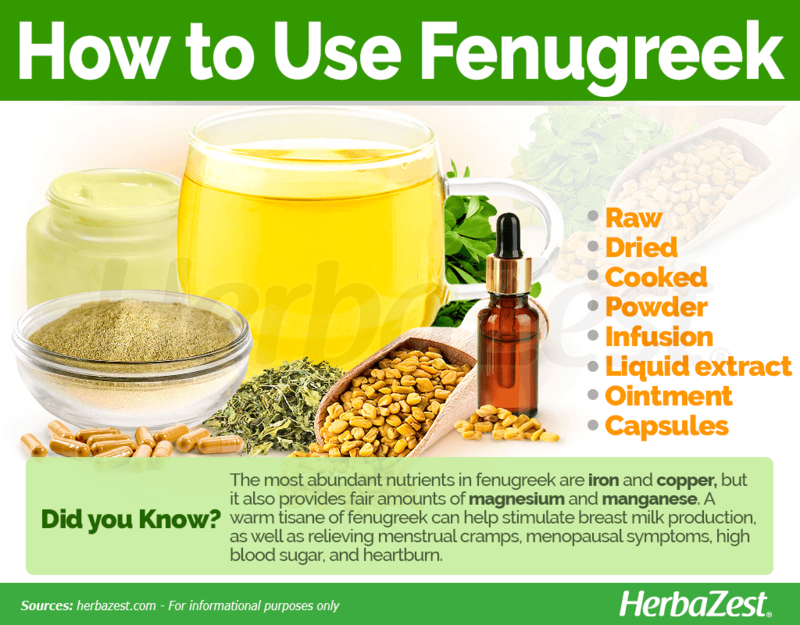 Furthermore, fenugreek provides manganese, a mineral that plays a role in protein synthesis, as well as in muscle and nerve function, blood glucose control, and blood pressure. The nutritional value of fenugreek is rounded by small amounts of essential minerals, such as calcium, phosphorus, potassium, and zinc, along with B-complex vitamins. 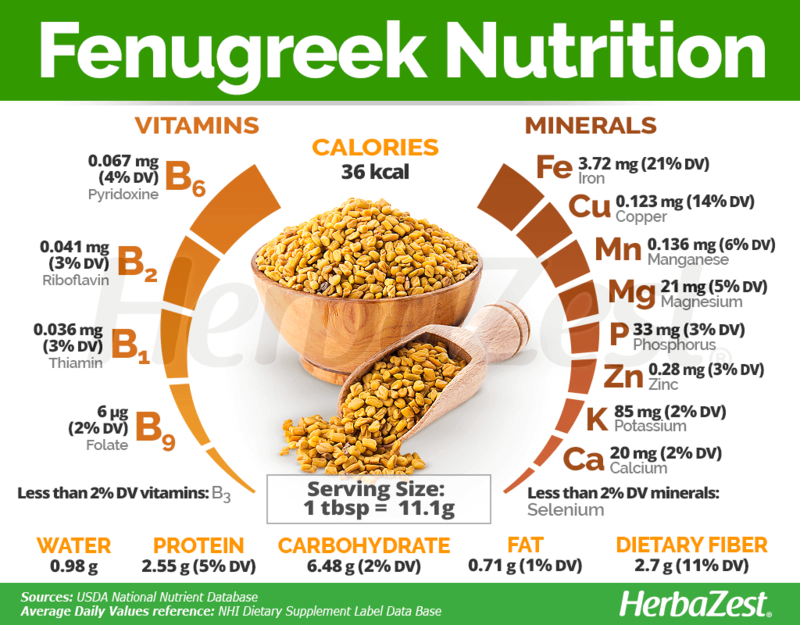 A single tablespoon of fenugreek seeds provides 36 calories and 11% of the recommended daily value (DV) for dietary fiber, along with 21% and 14% DV of iron and copper, respectively. For culinary purposes, fenugreek is used as a spice, an aromatic herb, and a vegetable, depending on which part of the plant is used. However, fenugreek health benefits are better absorbed when consumed in medicinal forms. Raw. The fresh leaves and shoots of fenugreek can be prepared in salads, in order to obtain the nutritional benefits of the herb. Dried. The dried seeds and leaves of fenugreek are often used to enhance the flavor of meat, poultry and marinated vegetables. Cooked. In Egypt and parts of Asia, the seedlings and pods are also consumed as a vegetable, and the dried leaves are used to flavor sauces and gravies. Powder. Fenugreek powder has become very popular as an addition to smoothies and beverages, since it is believed to enhance athletic performance and aid weight loss. Infusion. Fenugreek seeds can be brewed into a warm tisane to stimulate breast milk production, as well as for relieving menopausal symptoms, PMS, high blood sugar, and heartburn. Liquid extract. In this concentrated form, fenugreek can be taken to relieve the symptoms of menopause and support cardiovascular health. Ointment. When applied topically as a salve, the antioxidant properties of fenugreek are thought to be effective relieving the joint pain and inflammation caused by arthritis. Capsules. Fenugreek can be taken in fixed doses of two to three capsules, three times a day, avoiding the slightly bitter taste of the herb. Capsules are often taken to promote digestive health, hormonal regulation, and insulin production. Raw fenugreek can be found in some large food stores, but it is not a common. Instead, fenugreek seeds, greens of the plants, and powdered fenugreek can be found at specialized health stores or purchased through online retailers. The form of presentation selected is dependent upon whether it is intended to be used as an herb, spice, or vegetable. Fenugreek supplements can be found in specialized health stores; however, online retailers stock a wide variety of fenugreek remedies and supplements. Brands may come with different concentrations of fenugreek, and it is important to seek for medical advice before embarking on taking fenugreek supplements, especially for those who are pregnant or breastfeeding. Thought to be originated in the Mediterranean basin, fenugreek is an annual herb that rarely can be seen growing in the wild, since it is intensively cultivated for human consumption. This is a highly adaptable plant and can be easily grown in a variety of climatic conditions. Fenugreek requires planting in a position that enjoys full sun and has rich quality soil, with a pH between 6.0 - 7.0 and a good drainage system. Deep plowing is necessary before sowing fenugreek. The seedbed must be moist and fairly firm. It is best to plant fenugreek seeds in ground that has been treated with manure. They should germinate within two days after planting. Fenugreek is a drought resistant herb and it is also fairly frost sensitive. It can tolerate temperatures of 50-59°F (10-15°C). Pods should be harvested before they shatter. The fenugreek plant can grow up to 20 inches (51 cm) tall, and it is its seeds that are used for seasoning dishes. The seeds grow in a pod, with about 20 seeds in each. These tender pods, the leaves, and the shoots can also be used as vegetables. Fenugreek (Trigonella foenum graecum) is a member of the Fabaceae family, also known as the legume, pea, or bean family. It includes approximately 19,400 species spread out over 730 genera, making it one of the largest botanical families. Other well-known members in the Fabaceae family are alfalfa (Medicago sativa), peanut (Arachis hypogaea), soy (Glycine max), and tamarind (Tamarindus indica); all notable for having stipulated leaves, and easily recognized by their fruits. Fenugreek belongs to the Trigonella genus, which has 36 recognized species. To date, no subspecies or varieties of Trigonella foenum graecum, or sicklefruit fenugreek, have been identified. This species is considered distinct from wild fenugreek, from which it was domesticated thousands of years ago. Other members of the Trigonella genus are also referred to by the common name "fenugreek." Examples include T. caerulea, or blue fenugreek, and T. procumbens, or trailing fenugreek, though Trigonella foenum graecum remains the most common and medicinally useful. The fenugreek plant has been cultivated by humankind since ancient times, with its earliest remains dating back over 4,000 years. Ancient Egyptians valued fenugreek for its medicinal properties and used the herb in the mummification process; remains of its seeds have been found near the tomb of Tutankhamen. Romans in the 3rd century BCE used fenugreek herb as cattle fodder, and it was grown extensively in the gardens of Charlemagne. Fenugreek continued to enjoy popularity in southern Europe and Asia, gradually spreading throughout the world as a culinary ingredient and medicinal herb. The name of the genus, Trigonella, derives from the Latin for "little triangle", in reference to the shape of fenugreek yellowish-white flowers. On the other hand, foenum graecum means "Greek hay" and it is thought to be assigned by the Romans who got the plant from Greece, where the fenugreek plant has been a common crop since ancient times. Fenugreek is economically important as a culinary ingredient and medicinal herb, and the herb continues to be grown extensively throughout its native regions. India is currently the biggest producer of fenugreek, accounting for 80% of the world's production. Other major fenugreek-producing countries include Afghanistan, Iran, Pakistan, Egypt, Turkey, Spain, Morocco, and France. In ancient times, fenugreek was used as cattle fodder. Due to the pleasant look of fenugreek, it is also kept by some as an ornamental plant. Fenugreek essence is added to some cosmetics.